Abbotts Farm in Horbling, Nr Sleaford sleeps 18 people. 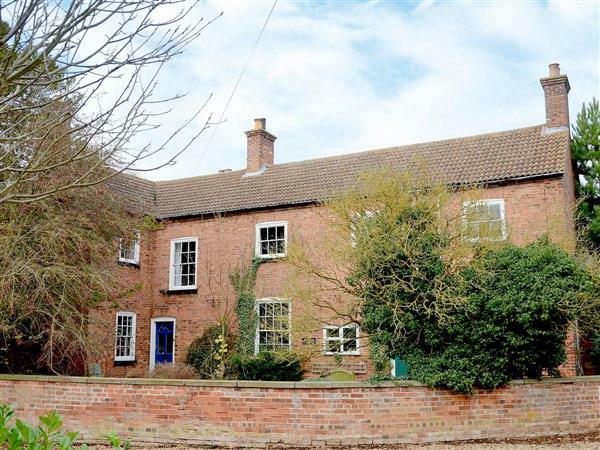 Set on the owners’ non-working farm in the pretty village of Horbling, this spacious detached farmhouse and barn conversion are situated in the heart of the Fens, making an ideal touring base for visiting the area’s wealth of historic attractions. Abbotts’ Farm (Ref RI2) has been refurbished to provide comfortable holiday accommodation for families while sympathetically retaining many of its original features, including exposed woodwork, an ornate cornice in the dining room and a traditional farmhouse-style kitchen. There is a second sitting room, a well-stocked library and huge video and DVD collection (including latest releases), providing plenty of entertainment for everyone. Outside is a large, private, rear lawned garden with apple, pear and plum trees, as well as gooseberries which guests are welcome to pick in season, and a large patio with garden furniture and barbecue. Paddock View (Ref REE6 [Paddock View]) offers ‘upside-down’ style accommodation for a group of four and is furnished with Georgian antiques, but also has a very modern kitchen and bathroom. The flat fenlands make ideal walking and cycling country, an excellent way to view the landscape with its rich farmlands, huge skies and wonderful sunsets; lovely walks can be enjoyed from the doorstep; ample facilities can be found nearby for golf, fishing or horse riding. Within easy driving distance a wealth of interesting places can be discovered, including the delightful old towns of Uppingham, Oakham and Stamford, full of beautiful mellow stone buildings. On the edge of Stamford stands Burleigh House, one of England’s greatest Elizabethan houses. Nearby Spalding is an attractive, Dutch-influenced town and centre of the flower-bulb industry, where the Springfields show gardens and the annual flower festival in May are popular. Other places to visit are the splendid medieval Tattershall Castle (National Trust), Belton House and Coningsby, noted for its huge one-handed church clock, and the home of the Battle of Britain Memorial Flight. One of the landmarks of the Fens is the magnificent octagonal lantern tower of St Botolph’s Church in Boston, greeting visitors from miles around. Shop and good pub with food ½ mile in Billingborough, or village pub 300 yards. Large living room and separate dining room with ornate cornice, each with open fire. Large beamed, well-equipped, farmhouse-style kitchen with Neff 6-ring gas/elec double oven cooker and twin sink. Utility. Second sitting-room with multi-fuel stove and sofa bed (for +2). Small library. Shower room with toilet.First floor: Seven bedrooms, each with TV/DVD, one with en-suite bathroom with over-bath shower and toilet; three double (one with half-tester bed), four twin (two zip & link). Bathroom with toilet. Bathroom with shower over whirlpool bath. For a better idea of where Abbotts Farm is, you can see Abbotts Farm on the map below. Abbotts Farm is in Lincolnshire; should you be on the lookout for a special offer, you can find all the special offers in Lincolnshire. It's always worth checking to see what is on offer at the moment. Do you want to holiday near Abbotts Farm (RI2), you can see other cottages within 25 miles of Abbotts Farm; have a look to find your perfect holiday location.